A relatively simple classic dish that is guarantied to impress you family and friends. Bacon and mushrooms work so well together. 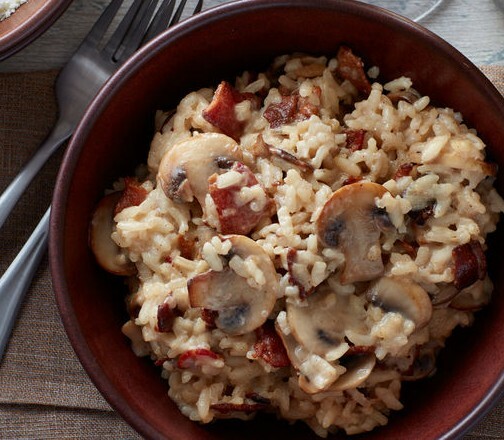 Adding the crispy bacon gives the risotto more texture. Lay the slices of Swiss Deli Streaky Bacon in a single layer between 2 sheets of baking paper, and place this onto a baking tray. Cook in the oven for 20-25 minutes until crispy. Heat a medium, heavy bottomed saucepan, add 20g butter and 60g diced onion and cook for 2-3 minutes on a medium heat. Do not allow the onion to colour. Add the rice and saute for 1 minute before adding 100ml white wine. Cook until the wine is completely reduced, before adding half the stock. Stir from time to time to ensure the mixture does not catch the bottom of the pan. Continue to cook until reduced before adding the remaining stock. When all stock has been absorbed pour the rice onto a tray to cool slightly. In another medium saucepan on a medium heat, melt the second 20g butter and add the remaining diced onion. Once the onion has softened, add the soaked dried mushrooms and cook for 1 minute, then add the fresh mushrooms. Continue to cook for a further 8 minutes until the fresh mushrooms have collapsed. Pour in 100ml wine and add the vegetables stock powder and reduce until the mixture is nearly dry (8-10 minutes). Finally add the cream, bring to the boil then simmer for 2 minutes. Placed the cooked rice and the mushroom sauce together in a large saucepan and heat gently until the rice is cooked to your liking (4-7 minutes). Remove from the heat and fold in the parmesan cheese and add 30g butter. Season to taste with salt and pepper. Serve on plates, and top with slices of crispy bacon. Finish with a drizzle of truffle oil, chopped chives and extra parmesan cheese.